Members of the Near Westside Community Impact Team are working together on many projects, including understanding the factors that contribute to neighborhood quality of life. 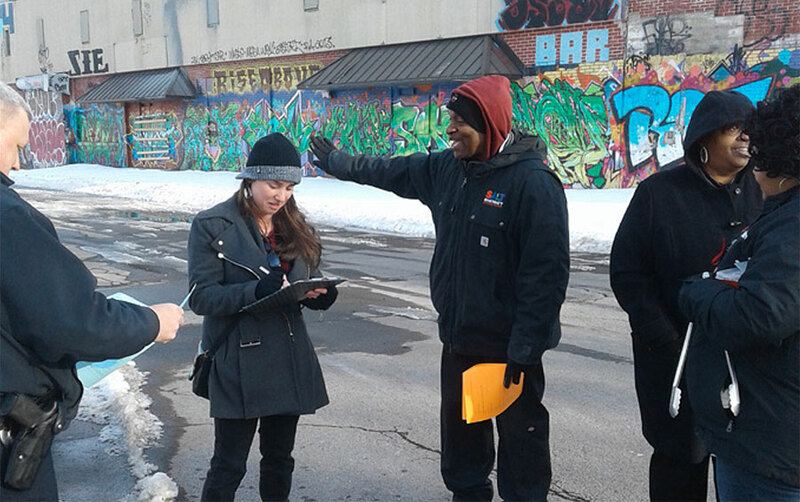 A grant to engage teenagers on Syracuse's Near Westside as co-researchers to investigate issues impacting their neighborhoods was received by ESF's Center for Community Design Research. The proposal, submitted by Associate Professor Maren King in the Department of Landscape Architecture in collaboration with The Near Westside Peacemaking Project, was awarded the grant by the Corporation for National and Community Service (CNCS), the federal agency responsible for the AmeriCorps program. Raising the Next Generation of Community Leaders is a participatory research project with Syracuse's Near Westside that will engage neighborhood teenagers as co-researchers to investigate, create new knowledge and develop action plans to address some already identified issues. Those issues include neighborhood youth "growing up quickly" amidst a backdrop of poverty, gun violence and drug sales, and with few opportunities to participate in skills-oriented activities, connect with relatable mentors, learn job skills and earn a good wage. As co-researchers, teen members will be introduced to research as a way of understanding and addressing issues, be mentored in youth-oriented methods, and create and own the process to identify, investigate and communicate the issues affecting young people's lives in the neighborhood. They will develop plans for actions that provide pathways for positive growth as individuals and community leaders. Intended outcomes include formation of a Youth Community Impact Team that will work in collaboration with the (Adult) Community Impact Team and other partners; two or more additional action projects that communicate positive change, teen leadership skills and civic engagement; and youth participants with choices stemming from their participation for continued education and higher wage employment. 100 percent of the total project costs of $99,092 are financed with federal funds. No costs of the project or program are financed by non-governmental sources.